Brunch is arguably one of the best meals of the day; you have multiple options of eggs, waffles, omelets, french toast, fruit, sandwiches, and more. And unlike breakfast, brunch allows a socially acceptable alcoholic beverage to be consumed before 12 noon. Win! 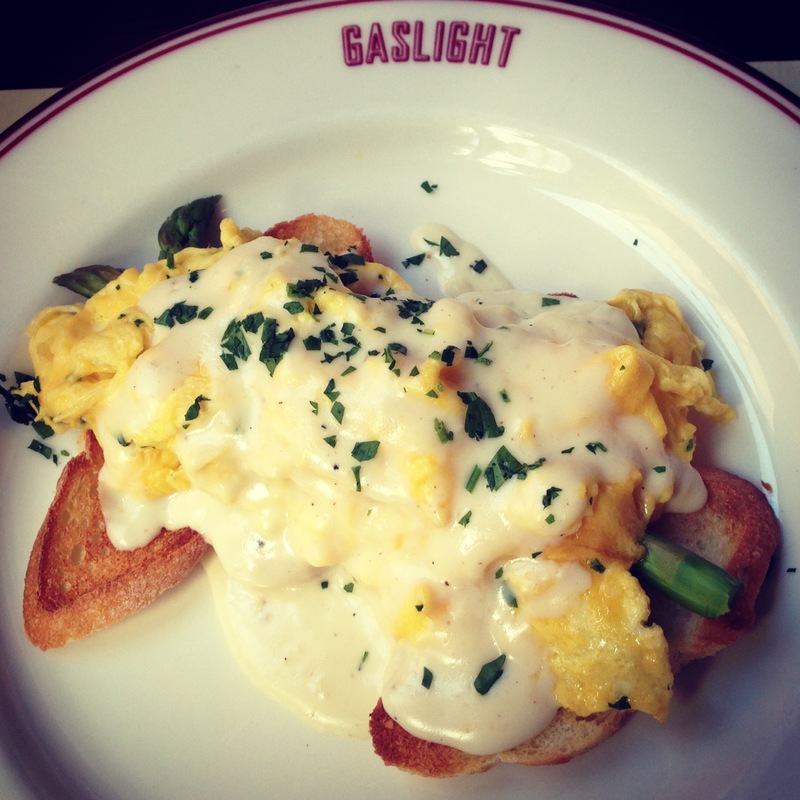 I’ve recently been on a brunch kick and visited Gaslight and Aquitaine within a week of each other. These sister restaurants are part of The Aquitaine Group, along with Metropolis Cafe, Union Bar & Grill, and the most recent addition Cinquecento. What Gaslight and Aquitaine have that is unique to Boston brunches is a $9.95 Prix Fixe menu (also offered at Union Bar & Grill). Each offer slightly different options but the outcome is the same: a delicious and filling meal for under $10, which is hard to find anywhere, never mind in the city. If none of the prix fixe offerings interest you there’s always the option to order from the regular brunch menu, which has items ranging from $7.75 for an omelet to $15.75 for steak & eggs. I arrived at Gaslight intending to participate in the prix fixe but just couldn’t resist the Truffled Scrambled Egg Tartin with roasted asparagus off of the regular brunch menu. I also opted for a cappuccino and a Bellini instead of the coffee / tea and juice which is included in the $9.95, oops! 🙂 No worries though, as this dish alone was $8.50 and really excellent. The sauce was a little heavy for me but it was easy to scrape to the side. The toast was slightly softened by the eggs (which I like) and still had a bit of crunch on the edges. I love my eggs scrambled and am a fan of asparagus, so this was a perfect meal for me! I would go back to Gaslight and probably order the exact same thing. Again, I was intending to partake in the prix fixe menu but the Benedict Provencal with Avocado, Tomato, Hollandaise & Fines Herbes, and Brunch Potatoes was really speaking to me! Poached eggs aren’t my favorite but I can tolerate them, and this whole dish was so good that I didn’t once wish they were my typical scrambled. The Benedict Provencal was $9.95, and as I ordered a Bellini and no juice, the only thing I really missed out on from the prix fixe was the cinnamon bun. Lucky for me my parents ordered the Spinach & Feta Omelette and I was able to taste their cinnamon bun which was really tasty! Even though I missed out on a few added bonuses I was still happy and more than satisfied with my brunch choice. 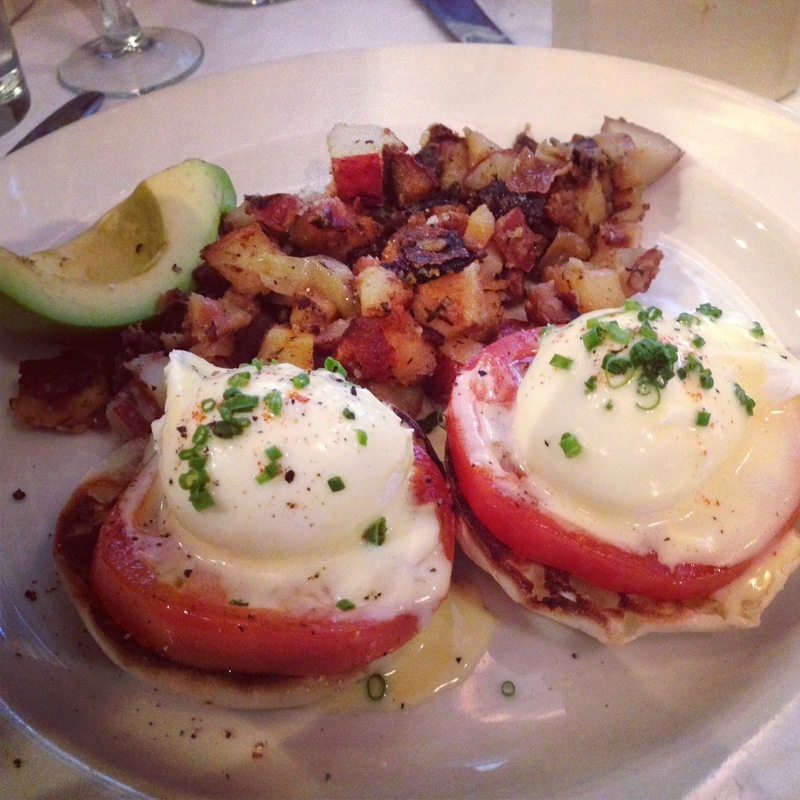 The eggs were poached perfectly, the tomatoes were fresh, and the potatoes were well seasoned and slightly crispy. Next time I’m going for the Croque Magret: Duck Confit and Gruyere Parisian Pressed Sandwich with Tarragon Mustard, Watercress and Pommes Frites – oh yeah! This entry was posted in South End by Dena Raffa. Bookmark the permalink.